Ramsey Emmanuel Lewis Jr. was born on May 27, 1935 in Chicago. From my perspective, Lewis is forever associated with the jazz scene in the black nationalist capital of the United States, that is “the Windy City,” aka Chicago. What are really interesting are the two main tributaries of Chicago’s jazz piano pedigree: popular and avant-garde. If we consider blues tickler Otis Spann on one end and the great mystic Sun Ra resplendently exhibiting the other light, it quickly becomes apparent that Chi is something else. My ears were mostly filled by Pittsburg-born but Chicago-based Ahmad Jamal but that was because of my leaning toward hard-core jazz more than the fusion variety. The deeper truth is that I got into Ramsey before Jamal, especially digging that triumvirate of high school friends that was the Ramsey Lewis Trio featuring bassist/cellist Eldee Young and drummer Redd Holt. Man, those cats swung like crazy and had an ultra-high degree of musicianship. My favorite album was that Live at the Bohemian Caverns Lp. This was before the radio hits: “In Crowd,” “Hang On Snoopy,” “Sun Goddess,” and so forth. This was when Ramsey piano chops were pushed to the fore. I really admired how the trio locked into a groove. Come to think about it, both Jamal and Lewis’s trios had a deep groove thing going; Lewis leaned more toward pop and fusion and Jamal was straight-ahead jazz, and between them they exemplified the sound of hip, Southside Chicago in the sixties. The fact that in the new millennium both are still performing speaks volumes about both the depth and length of their talents. One way to look at the surface difference between the two is that Ramsey Lewis was a party and Jamal was a private (i.e. intimate) affair. Like many people I think I made the mistake of de-valuing Lewis’ musicianship because it seemed to be too entertainment heavy. The truth is Ramsey Lewis is a hell of pianist not only in terms of technique but also in terms of his sense of structure and melodic sensitivity, all of which you can hear in the West Side Story medley that opens the Mixtape. Ramsey’s use of dynamics literally moves the crowd to be whisper-quiet during certain passages, and out-right screaming raucous during more dynamic parts as they provide spontaneous choral accompaniment. Ramsey Lewis is a masterful event planner when it comes to audience appeal and involvement. When the first trio broke up in 1966 after working and recording together for over a decade, Maurice White joined the band as the percussionist. White would subsequently leave to form Earth, Wind and Fire but also provided the foundation for “Sun Goddess,” one of Lewis’ major hits. On through the eighties and nineties when many jazz artists struggled to survive, Ramsey Lewis remained popular constantly touring and recording. With well over eighty albums as a leader, Ramsey Lewis has won three Grammys and probably holds a record as a recording jazz pianist, including a trio of albums featuring vocalist Nancy Wilson, the last of which, Simple Pleasures, features an outstanding “God Bless The Child” Nancy and Ramsey duet. This is music mainly for the good times when long-time friends get together, recall fond memories and plot future adventures. 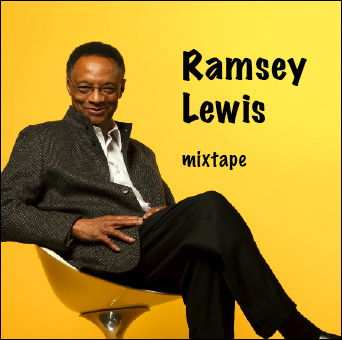 Ramsey Lewis offers us the soundtrack of joy and camaraderie.